BANGI, 3 Sepember 2014 – The public sector, especially institutions of higher learning should follow the example set by The National University of Malaysia (UKM) which had developed its financial and accounting system using its own expertise. Auditor-General Tan Sri Dato’ Setia Ambrin Buang praised UKM for devising its own University Finance and Accounting System (UFASt) to deal with its administrative and financial matters without having to outsource it. He was giving a public lecture on Public Sector/Statutory Bodies Auditing Issues in conjunction with the launching of UFASt which had been implemented since January 2013. UFASt is the result of a collaboration between the university’s bursary and its Information Technology Centre. UFASt is now being appraised by the National Audit Department for certification of compliance under the Standard Accounting for Government Agencies (SAGA). He particularly singled out UKM for obtaining a clean bill of health for auditing for 13 consecutive years in its annual financial reports. Tan Sri Ambrin, however, did not mince his words about many departments which are extravagant in using public funds that needed to be spent wisely. Too often we see government departments outsourcing to contractors, vendors and consultants to manage their projects. Unfortunately most vendors give weak or unsatisfactory services, he said praising UKM which did well using its in-house expertise. Tan Sri Ambrin expressed annoyance with the attitude of some government departments which practiced the three evils of wastefulness, extravagance and irregularities. Financial irregularities, he said, may also result in corruption and abuse of power in awarding contracts and procurements, especially if the awarding authority colludes with contractors and consultants. He said the National Audit Department found government projects, such as schools and hospitals, incurring huge losses due to mismanagement. Among the factors were rising costs, lack of allocation and shoddy workmanship. The recent Auditor-General’s report, he said, related numerous occurrences of wastages and extravagance in government departments. “I am very concerned that this might just be the tip of the iceberg and many cases had gone undetected,” he said. As an example, he said the national Audit department gives reports on a sample of only 35 schools from the 10,000 in the country. Auditors cannot monitor all schools all the time and can only scrutinise a small number of schools proven to be problematic. He said it is mandatory for all public sector workers to be held responsible over asset ownership and keeping government properties in good condition. “Don’t be indifferent to government assets. 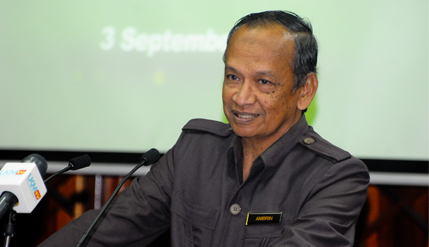 This means that apathy must be eliminated and heads of department must instill a culture of excellence amongst their staff,” Tan Sri Ambrin said. Civil servants needed to understand that the budget comes from the tax-payers, who are increasingly sceptical about the way their money is being spent by the government saying that they have a duty to serve the public well and provide good infrastructure. Deputy Vice-Chancellor (Student and Alumni Affairs) Professor Datin Dr Nor Aziah Mohd Awal and Treasurer Dato’ Mohd Rashid Mohd Fadzil attended the talk.